Get Credentialed in Medical Esthetics! The American Academy of Medical Esthetic Professionals, having recognized the need for certification in aesthetic practice, has developed such a program in accordance with commonly accepted aesthetic guidelines. Realizing that many medical practitioners practice medical esthetics and the knowledge required to administer these non-surgical medical aesthetic procedures safely are the same for all medical practitioners, be it an MD, DO, PA, NP, RN, or LPN/LVN. With this in mind, the Association of Medical Esthetic Nurses moved forward to bring together a cohesive group of medical esthetic professionals to form the American Academy of Medical Esthetic Practitioners (AAMEP) (herein known as the “Academy”). The Academy has appointed AMEN as the current administrator for the exam. 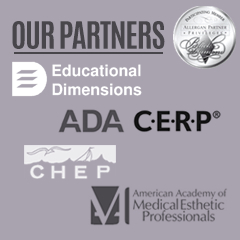 The Center for Medical Esthetic Certification (herein known as the “Center”) a division of the American Academy of Medical Esthetic Practitioners (AAMEP) bases its credentialing program on the standards set by other subspecialty credentialing organizations with the goal of promoting and enhancing esthetic practice excellence by certifying professionals. Certification is reserved for those practitioners who have met requirements for clinical or functional practice in the esthetic field, pursued training beyond basic preparation, and received the endorsement of their peers. After meeting these criteria, professionals take the certification examination based on nationally recognized standards of esthetic practice to demonstrate their special knowledge and skills which surpass those required for licensure. The credentialing board for the “Center” provides feedback in the following areas: development of the examination, passing scores, eligibility requirements, and certifying practitioners who pass the written examination and meet the requirements for certification. The certification examinations are objective tests that cover knowledge, understanding, and application of professional aesthetic theory and practice. The examinations are developed by a test development committee which is composed of expert representatives of the various areas of esthetic medicine. Recognized as having familiarity with current practice, these individuals are prepared by education and experience to have a comprehensive knowledge of the field. The committee defines content areas to be covered, relative emphasis, and the nature of professional abilities and skills to be measured by the tests. Examination items undergo a rigorous process of review and revision to ensure high quality. The subject matter is reviewed and critiqued, and each item is rated for accuracy and relevancy. The “Center’s” staff provides a psychometric and editorial review of test items. The test development committee responsible for the examination then selects an appropriate sample of items representing the specified areas of competency and staff prepares the final printed examination. Credentialing is an evaluative process that provides practitioners with the medical aesthetic specialties the opportunity to publicly demonstrate what they know and to be recognized for the knowledge they possess. On a voluntary basis, the Center provides certification examinations designed to test entry-level knowledge. The Center’s credential carries no licensing authority. The ability to practice is regulated by the state boards and the Center has no regulatory power to require states to recognize certification. Practice and educational standards are reflected in the credentialing process, but the responsibility for the development of such standards rests with the professional specialty organizations and the medical and nursing education community. The Center encourages individual healthcare professionals to seek out information about how certification relates to state licensure requirements and employment opportunities in their community. Upon successful completion of the exam, the professional may use Medical Esthetics Practitioner-Certified (MEP-C) to designate additional qualifications fulfilled. The Center plans to seek accreditation by the National Commission for Certifying Agencies, National Organization for Competency Assurance, American Board of Medical Specialties, and/or American Board of Nursing Specialties after the two years of mandatory testing has been satisfied. All aspects of the certification exam are in compliance with the accreditation standards in preparation for this process. Ask your patients if they value credentialed health care professionals-You bet they do! Ask a certified colleague what they believe about certification and you are most likely to hear that they think certification is one of the most important milestones in their career. You owe it to yourself to take the next step in your professional development. Earning your MEP-C will validate your expertise and will give you tangible recognition of your commitment to excellence in medical esthetics.